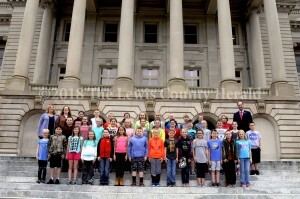 On Tuesday, House Minority Leader Rocky Adkins welcomed to the Capitol two groups of Lewis County fifth graders, who were there as part of a 4-H sponsored field trip. Those from Lewis County Central Elementary are students of Adam Bass, Tony Rizzo and Tyler Hurst, while the teachers for the Tollesboro Elementary students are Leslie Hay and Sharon Gatherwright. Counselor Kaycee Christy attended the field trip as well. Tollesboro Elementary students visit Rep. Rocky Adkins in Frankfort. 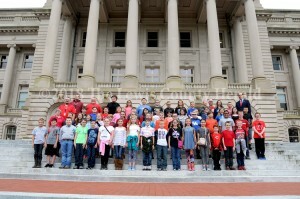 Central Elementary students visit Rep. Rocky Adkins in Frankfort.